In the early 70’s as a young 20-something, I lived in Larkspur, California, which is a beautiful little town right over the Golden Gate Bridge. I loved visiting San Francisco, and never tired of driving across the bridge to take in the excitement of one most beautiful cities in the world. I would go to Fisherman’s Wharf, Ghirardelli Square, The Cannery, Union Square, or Chinatown and just wander around taking in the sights and smells. Chinatown was always so loud and busy, and something new was always around every corner. 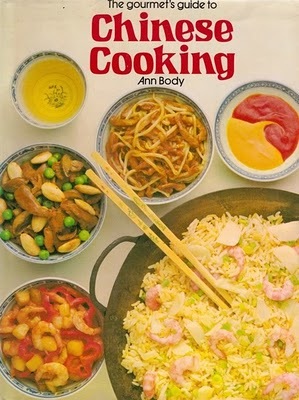 I decided to learn Chinese cooking, bought a wok, and this cookbook: Chinese Cooking by Ann Body. It was a good choice for me at the time. I loved the clear instructions and explanations along with beautiful photos. I came to realize that Chinese cooking is very complex and it takes a great deal of study to achieve its perfection. However, it can also be practical, economic, simple, and fun for someone just beginning to learn. I loved practicing various dishes from the different cuisines of China. Cantonese is probably the best known with its variety of dishes. Fukien is especially known for its seafood dishes, and is said to produce the best soy sauce. The Honan region brings hot and spicy, and Szechwan makes use of fresh, hot peppers either during the cooking or in the serving of its dishes. The Chinese are avid vegetables eaters, and take great pains to ensure that their vegetable dishes are crisp, colorful, fresh, and full of flavor. I loved this chapter as it changed my thinking about vegetable preparation. No more boiling and draining all the nutrients down the sink. I also loved the chapter on Dim Sum. Dim Sum, literally means “dot the heart,” although a rough translation might be “fill a gap,” since Dim Sum are seen as snacks, which can be eaten between meals. They are served at any time of the day and are the nearest Chinese equivalent to Western pastries. One recipe I made many times and never tired of, was the following for a stir-fry of pork and peanuts. To the Chinese, meat means pork, but they do, of course, eat other meats. But generally speaking, if a recipe states “meat,” then you can be sure it probably means pork. This book explains the harmony of Chinese cooking, with the blending of flavors and ingredients to excite the palate, just as an artist blends colors to a work of art. Only difference is, we get to eat the work of art that is Chinese cooking. Sprinkle the shelled peanuts with the salt. Heat a wok with the 1 teaspoon oil and fry the peanuts for 2-3 minutes; remove and drain on paper towels. Mix the pork with the cornstarch, soy sauce, sherry, and garlic. Add the 2-1/2 Tablespoons oil to the pan and stir fry the meat mixture for 2 minutes. Add all remaining ingredients and cook for 3 minutes. Stir in peanuts and serve immediately.